Welcome home Tennessee’s favorite daughter, Dolly Parton! The Annual Dolly Homecoming Parade features Pigeon Forge’s one and only Miss Dolly Parton herself and is one of the most attended events of the spring season. This years parade is scheduled for May 2, 2014, at 6pm , the parade attracts over 50,000 spectators and includes one-of-a-kind floats, marching bands, horses and even some local celebrities. Like many events in Pigeon Forge, the Annual Dolly Homecoming Parade is completely free. Everyone who attends the parade will get a sneak peak at the amazing and diverse entertainment found only in Pigeon Forge. I am caught in a sea of cars eager to escape the Atlanta’s grey sprawl of buildings and return to their cold garages for the weekend, while mine revs up for the 200-mile drive to the little mountain town of Gatlinburg, Tennessee nestled at the edge of Great Smoky Mountains National Park. Gatlinburg welcomes more than 11 million visitors a year to its hundreds of family-friendly activities, oddball museums and unique shops selling arts and crafts made by the nation’s largest organization of independent artisans. But I plan to spend my time riding down the snowy slopes of the ski resort at Ober Gatlinburg. This is a good recap of the trolley. Although, we were just there in January and took the trolley. I think it runs year round. One of the things I always try to do whenever I visit a new area is find a trolley tour. Most of the tours I’ve gone on have been sight seeing tours, some have the on again off again option so you cane hop off to explore a stop while other are just an excursion. In either case it’s a great way to get the lay of the land. 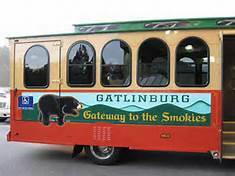 Gatlinburg has a trolley and from what I’ve read it’s a whole mass transit system. It sounds like the Tennessee equivalent of Boston’s MBTA. Most of the reviews indicate that parking is expensive and getting around by car , cumbersome at best. Everyone seems to recommend the trolley. The trolley line map looks like our subway map and it looks like most things are accessible from the trolley stops.